Discussion in 'BushClass USA' started by One Legged Josh, Apr 29, 2011. I made this on a few years ago for my daughter, she liked the colors! pellegrino and Teeps like this. This is the first on my electives, I went to the local army navy store and I bought some clips to use with mine made it easy. I have another set of clips thinking about making one for my wife. I made a dog collar instead of a bracelet. Consider it just an over-sized bracelet. Bracelet done, as per the video instructions. That completes all the ‘string thing’ skills for me. It’s so windy today I nearly blew over trying to take a photo. Next, I will probably do all the fire-related skills. Or perhaps the food-related ones. I find it more logical to group similar skills together. pellegrino and The Desert Rat like this. 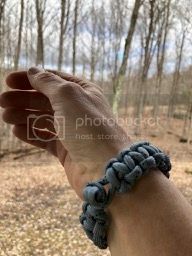 Basic cobra weave with knot and loop fastener.